URGENT >> BULLETIN >> MOVING: UPDATED 5:21 P.M. EDT (U.S.A.) Remissions payments to AdSurfDaily members fleeced in an alleged global Ponzi scheme are beginning, a source tells the PP Blog. It was not immediately clear how Minnesota-based Rust Consulting Inc. — the government-approved claims administrator — would roll out the compensation plan and how long it would take for all members with approved claims to be notified that their payment will be on the way. But the PP Blog has confirmed that an ASD member in Minnesota has received a formal notification that the member’s claim has been approved and that funds will be electronically deposited within the next 15 days. (See screenshot below.) The payments are being funded from money seized by the U.S. Secret Service in the civil portion of the ASD case. Separately, AdSurfDaily President Andy Bowdoin — who faces criminal charges of wire fraud, securities fraud and selling unregistered securities — continues to flog away on Facebook and a separate fundraising site to raise $500,000 to pay for his criminal defense. After nearly two months of nonstop fundraising, Bowdoin reportedly has fallen 95 percent short of his goal. He’ll now be issuing his appeals even as ASD members he is accused of defrauding are receiving remissions payments from the proceeds of his alleged $110 million Ponzi scheme. In sworn court filings, Bowdoin has claimed the money seized in the case belonged to him. At least 11,000 people have identified themselves as victims of Bowdoin’s Ponzi scheme, according to court filings. 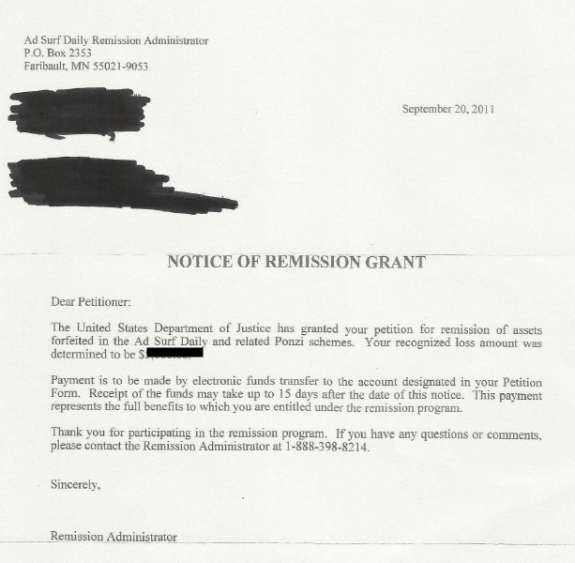 Screenshot: Remissions payments to AdSurfDaily Ponzi scheme victims are beginning, according to this letter the PP Blog obtained today from a source. I bet Andy is crapping in his pants with this news. There goes his claim for his need to raise money for his defense fund to get the members money back. LOL! Of course it was all BS anyway, but if he thought he had problems raising money up until now, this is the kiss of death to his fund raising attempts. Guess this means he will have to fund it himself. If the timing works out right, all should have their money back before Andy’s court appearance on Oct 21. Talk about poetic justice. Maybe Andy sent in a remission form…? I’m thinkin’ jail time is in his future…! I want to reply to your Bulletin and congratulate you on keeping all of us so well-informed over the years on this ASD nightmare. As you know, I did a couple of guest columns for you related to certain Texas residents who shall remain nameless as well. I want to thank you for your dedication to keeping on top of all of this, especially in the height of drama back in 2008. You were a Godsend to us out here then, and you deserve kudos for your excellent work in reporting the facts in the case, and for serving as a reliable source of information. And you did this despite attacks from others via the web. So, from the bottom of my heart I thank you, on my behalf and for so many others who may no longer be checking the blog. If they filed a claim and are still at that address, they should get a letter. Initially I asked you to not post my name on the bulletin, but I am more than happy to share that the person who contacted you was indeed me. I also shared with you that I called Rust to confirm this was NOT a joke, not some fluke, and had two wonderfully confirming conversations with them. They are very helpful folks and I encourage anyone who gets a letter and has questions (for example, if you changed banks since you filed your claim) to call the number on the letter. As I told you when we talked, your blog, your reporting and accuracy were an important part of my life in dealing with this chaos created by ASD. I thank you for that clarity and sanity, Patrick. Especially when it hit the fan and I found myself being threatened by some Texas citizens who have far more firepower than I do legally! You gave me a venue to express my concerns and share with others so that they, too, could benefit from what I had learned locally. So, thank you from the bottom of my heart for being there, for caring enough to stick with it and with us. I think so many had given up on ever seeing their funds come back. Thanks to your continuous coverage, despite being attacked, many of them will be restored 100%.